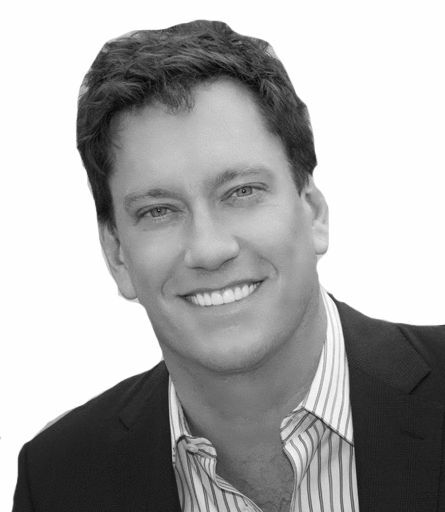 The challenge is how to break through skepticism, fear, and old habits to foment change. It's a thorny problem, and finger wagging or soapbox yelling isn't enough to change hearts, minds and wills. As with anything related to human nature, the more we appeal to people's interests, the more we'll find a receptive audience. For companies, the bottom line benefits of sustainability are becoming increasingly apparent. According to The Climate Group, research shows that the most green-focused companies have seen a 27 percent return on their low carbon investments. "Lowering risk, protecting against price rises, saving millions and boosting brand is what shaping a low carbon economy is all about," CEO Mark Kenber said in a statement. That helps explain why thirty-six global corporations have now made the ultimate commitment to this issue, pledging to transition to 100% renewable energy. The companies -- including Nike, Walmart, Goldman Sachs, Johnson & Johnson, Procter & Gamble, Salesforce, Starbucks, Steelcase, and Voya Financial -- have all signed on to the Climate Group's RE100 pledge, with the hope of showing international governments that businesses are aligned in the effort to divest from fossil fuels. But of course corporate interest in sustainability extends beyond just a narrow-focused ROI. The coalition of philanthropists, activists and policymakers that were part of the RE100 pledge includes the United Nations and the Rockefeller Brothers Fund, the latter of which had previously announced that it would remove all of its $866 million in assets from fossil fuels, thus departing from its own founding business. If you define self interest as wanting to save the planet upon which you reside, this pledge makes sense even when it conflicts with your company's near-term financial interests. For individuals, there's one more reason to bring cloth bags to the supermarket. It turns out that being sustainable can increase your happiness. A recent social experiment by Tetra Pak, the world's leading food processing and packaging solutions company, challenged leading bloggers in five countries to take small steps to adopt simple, renewable habits. The Renewable Living Social Experiment, conducted in partnership with University College London and Tilburg University, showed a significant increase in both how habitual the behaviors became, and how happy they made the bloggers over the 28-day period. Tetra Pak is promoting these findings through Renewable Living, a campaign in the U.S., Canada, and 20 other countries. Its tagline appeals directly to the human quest for happiness: "You have the power to be happy and protect the earth by adopting simple, renewable habits. Find out how #RenewableLiving can work for you." Here's another novel way to get people to care about their planet: through sports. Seventy percent of humans watch sports in some way, making it one of the most universal pursuits on the planet. When you marry the passion for sports with a social issue, then you have a megaphone for causes that is unparalleled in its reach. That's why Jackie Robinson broke the color barrier in baseball almost a decade before the civil rights movement made real headway elsewhere, why Muhammad Ali was able to draw huge attention to the anti-war movement, and why Billie Jean King made such significant strides for the women's and gay rights movements. It's high time that sports served as a catalyst for the environmental movement. And there's a team of champions and entrepreneurs who are doing just that, training their sports greening focus on the America's Cup, the oldest sports trophy in the world. Every four years, countries compete for its honor, and this year the America's Cup racing returns to New York Harbor for the first time in nearly 100 years, from May 6th-8th, with the America's Cup World Series, a year-long series of prep races that culminate with the 2017 America's Cup in Bermuda. The event will draw big crowds in Lower Manhattan and mammoth media attention in this country and around the world. It goes without saying that when you watch the America's Cup, you're looking at the ocean -- one of the greatest areas of concern for the environmental movement. 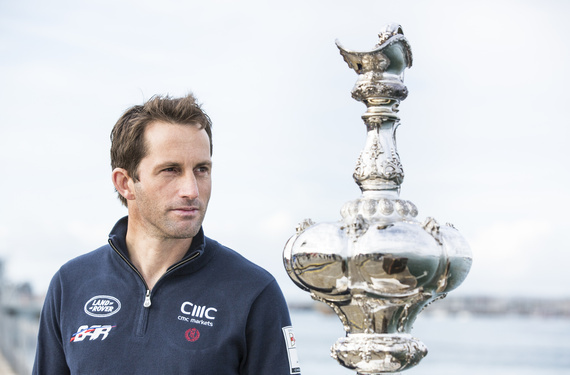 That's why Sir Ben Ainslie, the most decorated sailor in Olympic history and a key member of 2013 America's Cup winner Team ORACLE, and his Land Rover BAR team from the United Kingdom are training to win the America's Cup while, at the same time, reducing its carbon footprint. 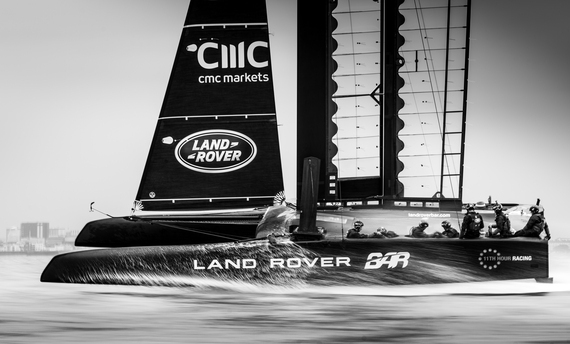 In fact, while the two pursuits may seem at first glance to be unrelated, it turns out that Ainslie, Land Rover BAR and its exclusive sustainability partner, 11th Hour Racing, are working together to prove that going green through advanced technologies (recycled carbon fibers, virtual support boats, etc.) can reduce carbon emissions while helping the boat go faster. 11th Hour Racing is a Rhode Island-based organization committed to greening the world through sailing, funded by Google founder Eric Schmidt and his wife, Wendy. Their efforts to promote change to save the oceans are chiefly led by sponsoring elite sailing teams that embrace the transition toward clean, livable oceans, renewable energy -- and accelerate the greening of the squad's operations. One such team is Land Rover BAR, skippered by Sir Ainslie, who as leader of his own team is looking to win Britain's first-ever America's Cup in the greenest way possible. As the Michael Jordan of sailing, Sir Ben Ainslee's experiment to change the world while having his boat perform better by being sustainable is just the sort of high-profile story that can capture the global imagination. It's a compelling example of the burgeoning but still under the radar movement of the greening of sports, and another way that the environmental movement is making breakthroughs by focusing on areas that hold the most interest for people. In 2016, we don't have the luxury of an annual Earth Day. Every day must be one in which we try to reverse climate change and communicate the message to people in ways that are most appealing. As citizens, political figures and corporate leaders have more personal reasons to support sustainability than not, that's when we see the kind of progress that this planet so desperately needs.